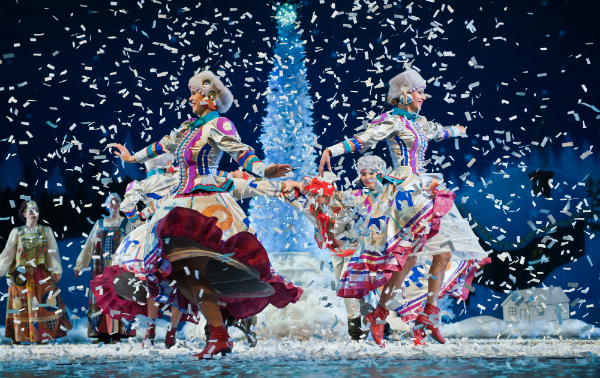 Dance Mogul: As a performer, what has The Snow Maiden experience been like? Alexander Rudoy: My name is Alexander Rudoy and I have been performing in the “Snow Maiden” production for 3 years. It has been an amazing experience performing on big stages in different cities bringing joy and happiness to children and adults alike. My favorite part of the show is the direct interaction with the audience in the beginning (when actors get to talk to kids from the stage), as well as in the end of the show (when the dancers go into the audience to sprinkle white confetti over the heads of delighted viewers). It really is a treat to see the smiles, excitement and holiday spirit in the eyes of the kids in the audience knowing you partially made it happen. We have a delightful team of actors, dancers and singers and it really is a pleasure and honor to be part of the team. Dance Mogul: Based on the language barriers do you feel the audience in the US still get the purpose of the show? Alexander Rudoy: In addition to being very entertaining, the “Snow Maiden” is an educational experience. 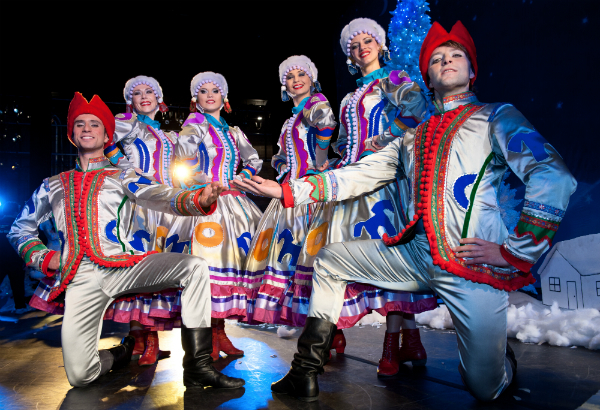 The costumes, the music,choreography and other components teach kids and adults about Russian culture and Russian Christmas traditions. Language barriers melt away and give way to universal principals of love, compassion and understanding on a deeper level. The show teaches that if you are a good person, you will be rewarded and punished if you have been misbehaving, which is the same principal as Santa Claus in the US. Overall, even if the audience member does not understand a word of Russian language, one will still enjoy the spectacle, beautiful singing and music and wonderful Russian folk choreography. 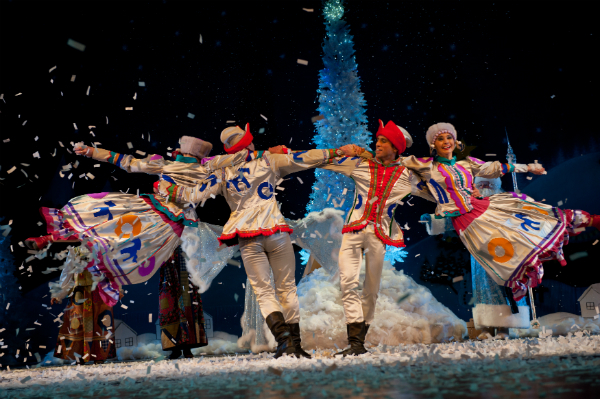 Dance Mogul: Take us behind the scenes of The Snow Maiden, what are rehearsals like? Alexander Rudoy: The show is choreographed and directed by the amazingly talented Andrew Ivan. It is a real treat to be working with him on any production because he manages to make rehearsals fun, yet get out of the performers their best. During rehearsals Andrew manages to teach us so many things and open so much potential in a very short period of time, that sometimes its hard to believe that you are actually getting years of schooling in a month of rehearsal time. The choreography can be challenging but always a lot of fun to learn and perform. Dance numbers often involve a lot of acting and since dancers play several different characters in the show, its important to be able to get in touch with your inner self. Dance Mogul: What is your best advice for a dancer that wants to take part in shows like The Snow Maiden ? Alexander Rudoy: Any dancer who wants to take part in the show like “Snow Maiden” has to have a strong background in Russian folk dance, gymnastics, acting and vocal training as well. The show is challenging – it involves a lot of quick costume changes, high Russian jumps, as well as signature Russian tricks for male dancers (Polzunok) when a dancer squats down and kicks his legs forward from under him. Girl choreography involves a lot of Russian turns (on spot or across the stage) as well as fancy Russian footwork (Drobushki). Some of these moves require extensive training and most of our dancers had time to practice since a very young age. But one thing I can promise is that any dancer attempting to join our team will have lots of fun and plenty of positive energy, as well as an enlightening learning experience.